Bus detours and road-lane changes are coming next year, to get people through downtown Seattle when construction projects push buses out of the transit tunnel. Seattle is on a collision course between construction and transportation by fall 2018, when a pair of major projects will push buses out of the downtown transit tunnel. Streets on the surface are considered too full to add traffic, and an additional 10,000 housing units and 11 million square feet of offices are already being built. So planners think the tunnel buses, and some others, should terminate at a light-rail station — compelling riders to transfer onto a train if they wish to continue through downtown. Besides the continuing pressure from the Amazon campus, hotels and residential towers, several public projects in Central Seattle will block street lanes or force transit detours over the next five years. • Replacement of the Washington State Ferries terminal. Sound Transit 545 coming from the Highway 520 bridge would halt at University of Washington Station, while the 550 arriving from the I-90 bridge would end at International District/Chinatown Station, according to a leading option that transit planners released at a briefing Thursday. Certain routes from Georgetown, Burien and West Seattle might also feed into Pioneer Square Station, while buses from Northgate and Lake City could finish at Westlake Station. Though a transfer from bus to train consumes several minutes, travelers ought to regain some time, because light rail arrives as often as every six minutes and won’t get stuck in traffic, said Eric Tweit, program manager for the Seattle Department of Transportation (SDOT). The transit tunnel’s northern bus entrance and access ramps, at Convention Place Station, will be overrun by expansion of the Washington State Convention Center. Sound Transit plans to start building light-rail tracks for its future East Link line near the tunnel’s south entrance, and stop running buses into the tunnel next year, because it will close anyway for the Convention Center project. Otherwise, Sound Transit buses could access the tunnel until 2020, said agency spokesman Geoff Patrick. Currently, at least 15,000 people come and go on tunnel buses, just from 3 p.m. to 7 p.m. on weekdays. Related plans to add downtown bus lanes would affect thousands of drivers, bicyclists and pedestrians, as competition for space on city streets becomes more feverish. Thursday’s announcement of the One Center City strategy kicks off a year of public forums and government votes about the proposals. Two-thirds of central city commuters already arrive by transit, ferries, walking, vanpooling or other alternatives to driving alone. There remain more questions than answers — like whether or where the city will build downtown protected bike lanes as promised earlier in the Murray administration. Or how car commuters will reach I-5, if buses are given a lane of Fifth Avenue, which leads to freeway ramps. Or how Sound Transit will assure enough railcars and reliability. • Build a “couplet” of more bus lanes on northbound Fourth and southbound Fifth avenues, so Fourth would have two bus lanes. • Make Fifth Avenue a two-way, predominantly transit street, while changing Sixth Avenue to take more cars, as a major two-way thoroughfare. • Move buses off Second and Fourth avenues, so that even-numbered streets would be more efficient for motorists, and re-time traffic signals. Odd-numbered streets would favor buses. First Avenue would include transit-only lanes for buses to share with the future First Avenue streetcar. 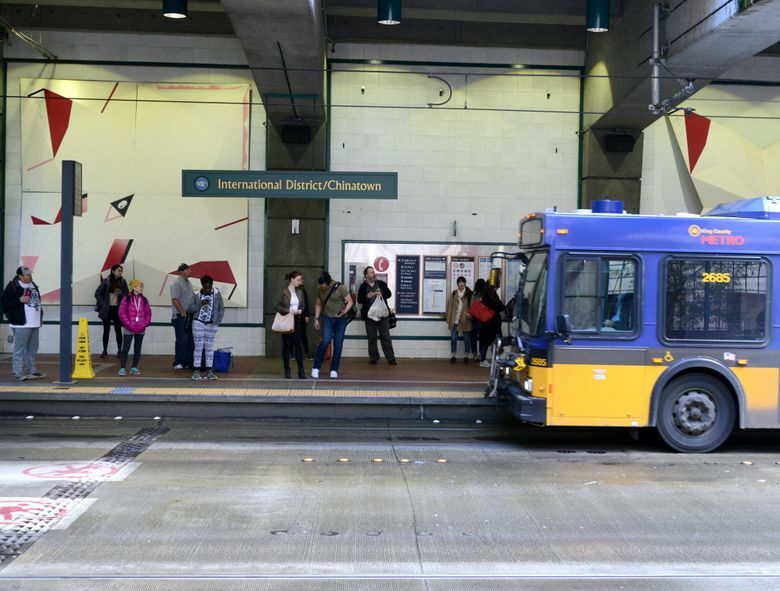 King County Metro Transit would need to buy buses with left-side doors, to serve median stations on First Avenue, and in the Madison Street bus-rapid transit corridor, said Metro deputy director Victor Obeso. • “Activate” large plazas at Union Station and King Street Station where more transit riders would go, similar to Westlake and Occidental parks where concerts, lunch tables and games were added. • Increase bicycle, walking and bus priority on Pike and Pine streets between Capitol Hill and downtown. A grass-roots coalition has been suggesting a lid over I-5 in that general area. Metro is up to the challenge, Obeso said, based on its experience diverting tunnel buses and 50,000 daily riders to the streets from 2005-07, while the tunnel was retrofitted for the 2009 launch of light rail. Updates are being posted by transportation agencies and the Downtown Seattle Association online at OneCenterCity.org.